We found a nice spot to camp at a little creek on the way to Little Murray one Easter long weekend and while scoping out the area three 4wds pulled in and asked us what our plans were, we said we were checking to see if it was a good site to camp as Little Murray was full. So out jumped four National Park rangers and eight police officers to let us know we couldn't camp there. 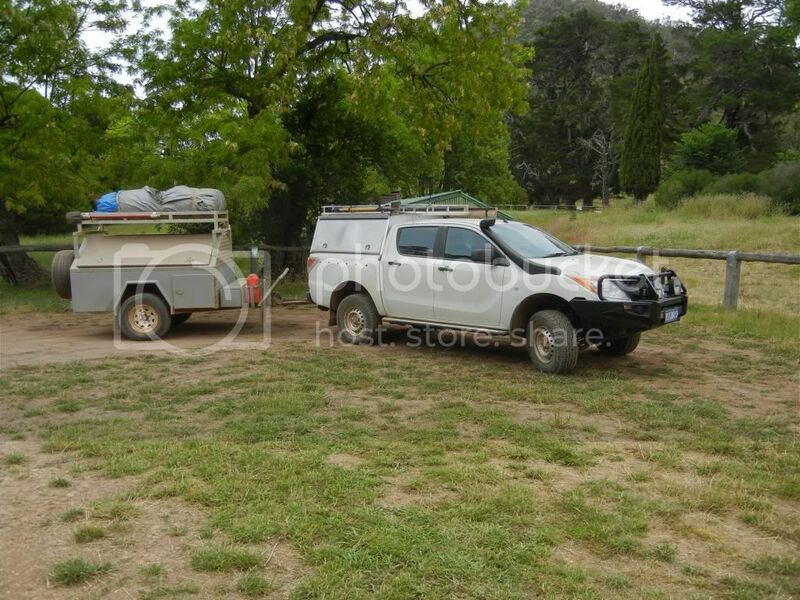 On the long weekend the Rangers and the police camp up the track at the end of Little Murray camping area so I have never had any trouble while camped there. Wow. 12x blokes telling you to move along........overkill much? They weren't around when we were there that's for sure. Didn't see any rangers the entire time we were there. I dare say they could have cleaned up too. Out of all the people we saw camped, I didn't see anyone except us pay a visit to the fee box or displaying a tag. Last edited by Timmo on February 5th, 2015, 1:50 pm, edited 1 time in total. We were a bit shocked to see so many get out. Some of the Rangers were women but I guess they were on their way back to camp. Easter and the October long weekend gets busy up there and that's when you see them. Congrats on a well thought out, planned & executed build. Something to be proud of. And you've got the family / mob with you - a significant feature as well! Have you considered the need to protect the electrical components you have mounted internally up the front? I'm coming from a not dissimilar trailer in some ways; but knowing that things move around almost no matter what ya do, I'm concerned that they are a tad vulnerable. Would a light removable mesh panel help to protect them? Mazda BT50 DualCab XT auto, new in April 2012. ARB bar, side rails, steps, suspension. Redarc trailer brakes. Anti-spinifex plate. Lightforce HID's. Extra 5 micron fuel filter. Custom Al canopy on ute. Designed as a touring rig. Initially I had thought of placing a barrier of sorts but rather than make the switchgear harder to get to, I chose the option of securing everything in the trailer with tie downs to prevent damage to the components. In the top of the drawer system there is 10x (originally 6x but I have since added 4 more) spring loaded and recessed stainless steel tie down rings and everything that goes in the back gets secured to these with ratchet straps so there is absolutely no movement whatsoever. The tie downs are positioned to account for every possible configuration I could ever need to use. If they are not in use, they sit flush with the drawers until needed. It is overkill considering what is carried in the back but I'd rather it be over-engineered. The only stuff that is secured on top of the drawers is our 4x self inflating mats, 4x sleeping bags and pillows so nothing that would even do any damage as such but I erred on the side of caution and tie it all down anyway. I have also allowed for a clearance of 200mm from the electrical gear to the secured gear inside to give it decent airflow to avoid the chargers overheating. 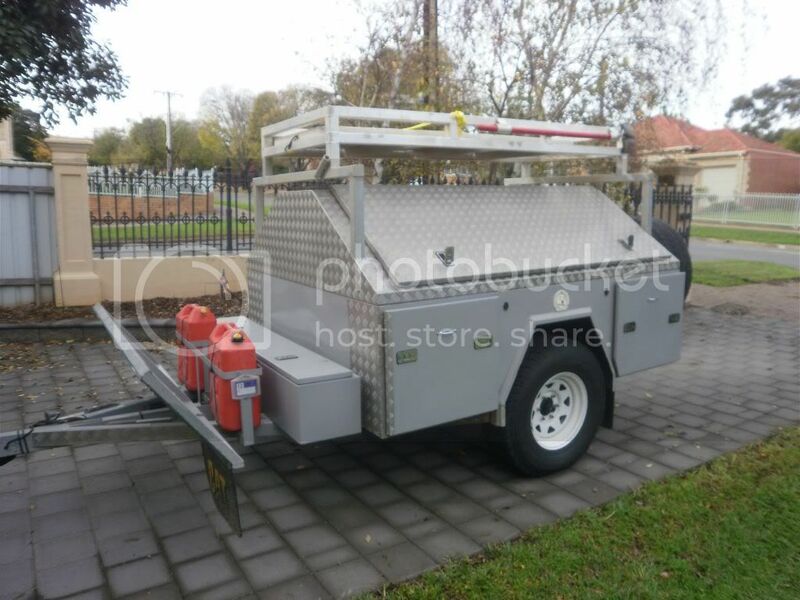 Have you got a build thread for your trailer mate? Looks like it has had some thought gone into it. Gotcha re securing the internal load. I decided to replace the hoses to/from my water pump and kitchen. I was using 1/2" food grade water hose encased in spiral wrap but have had a couple of leaks where the hoses join to the barbed fittings with hose clamps. I have replaced it all with EPDM flexible stainless braided connectors hoping that they will also have better abrasion resistance. They are far more flexible and rated to 1500kpa so should go the distance. I bought myself a "Travel Buddy" 12V Oven and decided to build it in to my trailer at the back next to the kitchen. The idea being that we can chuck our dinner in there to cook/heat up upon arrival at camp and saves us the hassle of having to cook after setting up on the first night of a trip. 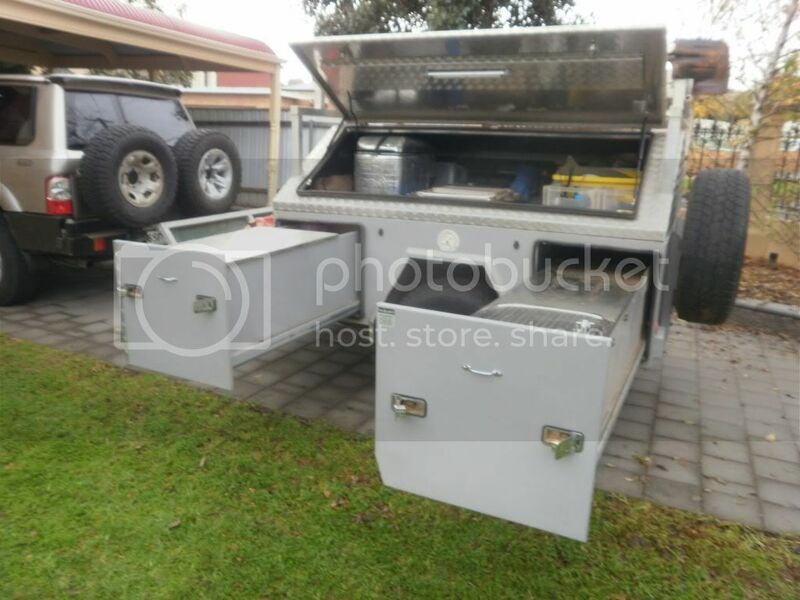 It is also easily accessible behind the tailgate so it's just a matter of opening the tailgate to get to it which makes it convenient enough to load up with food on long drives so we can have hot food when we pull over for a break. I built up a box/shelf that is bolted in alongside my slide out kitchen and sits above my water pump (which you can see in the photo in the above post). Makes use of some otherwise wasted space. Carpeted with some Aluminium angle to finish off the edges. 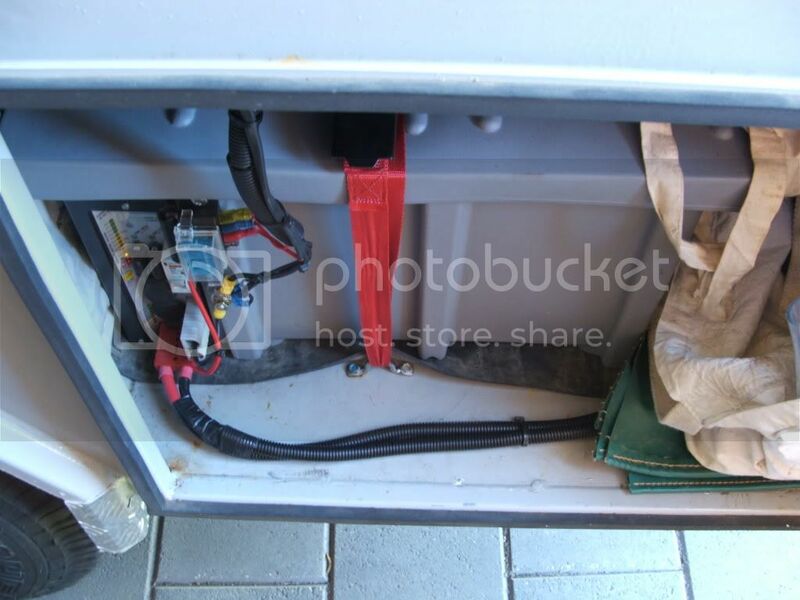 The travel buddy is hard-wired into the trailer electrics with it's own dedicated circuit at the fuse box. Even though the unit has its own timer/switch on the front, I have wired it in with a Carling rocker switch beneath it.